The long since thought of but yet to be commercialized in-orbit servicing industry is now closer to becoming a reality than ever before. ViviSat, a joint venture supported by Orbital ATK and US Space, has signed a pivotal customer for its Mission Extension Vehicles (MEVs), tipping the scale from buildup to actual implementation. “We now have four MEV’s signed with clients. That puts us in a situation where we have the critical mass necessary for financing and to carry forward,” Bryan McGuirk, COO of ViviSat said during the “Spacecraft Repurposing Debate: Proponents and Skeptics Go Head-to-Head” panel at SATELLITE 2015. As of the summer of 2014, ViviSat had three customers committed to in-orbit servicing using MEVs, with the driving rationale being to test out new orbital slots for future satellites. McGuirk said three of the four clients intend to use the MEVs to provide this service. Now that a decisive number of customers has been reached, ViviSat plans to begin dual launching two MEVs at a time, with missions lasting five years at a time before the end of the decade. 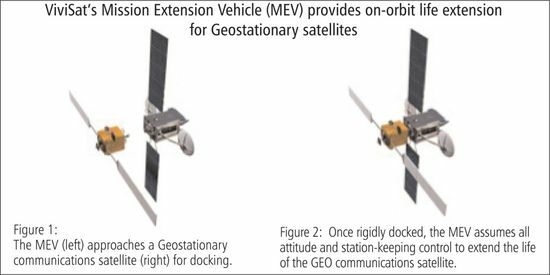 MEVs have a mission lifespan of approximately 16 years and sport longer antennas and arrays to better dock with spacecraft. The vehicles also use electric propulsion. Nice system. A solar electric tug. It’ll go far. I thought a particular vocal alt-spacer held a patent on this concept a few years back. If so, I hope he was compensated in a fair manner. Latching on to an out of fuel satellite and towing it back into the right orbit is not going to keep it there. If some form of propulsion pack is going to be fitted to exhausted satellites then it won’t be able to carry many of these items and good luck with making that can of worms work. Considering that a xenon fuel load will last a “electric” satellite for essentially it’s lifetime, what is the use of sending up a tanker to refuel them? If it is going up to refuel what is up there now with hydrazine that will be a neat trick since the ones up there cannot be refueled. So it would only apply to new satellites with a compatible refueling system. But if you are going to build new satellites and have them refueled by a solar electric tug why not just make the new satellite solar electric? These kinds of schemes always have something going on behind closed doors or they would not even be considered. What is going on here appears to be a company telling other companies they can make their satellites last longer in some fashion but exactly how they are going to do that is not clear. The solution to planet Earth’s rapidly worsening satellite junkyard is semi-permanent large Von Braun wheels with human crews to maintain the equipment. The problem is of course such stations would require a bare minimum of several hundred tons of radiation shielding and more realistically a couple thousand tons of water. The only place to get that shielding is the Moon. It doesn’t refuel the satellite, it takes over attitude and station keeping. If it restores a satellites to service for less cost than launching a replacement, then it’s economically viable. And it seems they have paying customers. You could spend billions of dollars building a gigantic spinning wheel with thousands of tons of shielding. Or you could just use a robot. I predict the market will select only one of those options. I would think that communication satellites are fresh goods. There might not be much value in prolonging the orbital lifetime of a ten year old satellite, when a replacement would be ten times more capable. And it is obviously easier, cheaper, safer to supply the satellite sufficiently from the beginning once and for all. This is a tough business case. If it could salvage failed satellites, like Fobos-Grunt or some GPS satellite misplaced by Proton. But that would require unreasonable flexibility and delta-v. Without knowing the full capabilities of these systems, all I can do is to speculate on some possible uses. 1. Use as a space tug to remove old GEO satellites that weren’t moved to graveyard orbits or who suffered a malfunction and couldn’t be moved out of GEO. 2. Provide attitude control support to a satellite that has lost multiple reaction control wheels. 3. Allow a satellite that’s still functioning but low on propellant to operate for additional years, perhaps in secondary markets that can’t afford new satellites. Of course, there’s always the possibility of performing offensive space control “dirty tricks” but that would be military, not civilian vehicles. That’s a common perception, but major comsat manufacturers update their designs quite slowly. They’ve been fairly standardised for years. The main things that improve on new generation comsats is the power and propulsion. Yeah, I suppose they need stuff like radiation hardened electronics and that little niche market doesn’t invent the wheel again every year.